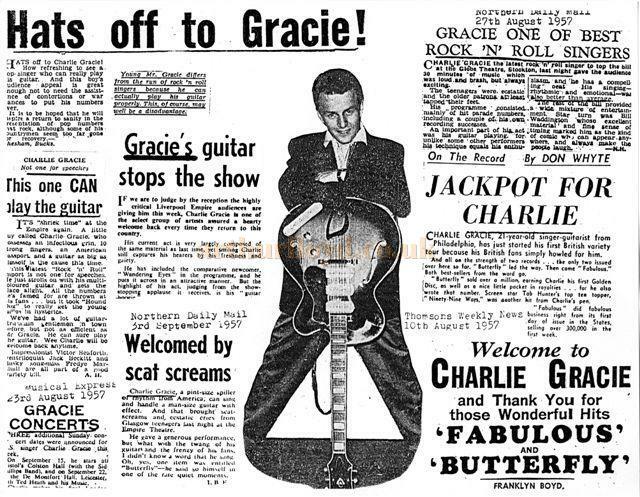 My father, Charlie Gracie, was the first solo American rock 'n' roll star (after Bill Haley's Comets), to bring the music to the U.K. (1957), was the last star to headline at the London Hippodrome (August '57), before its conversion into a cabaret house in '58. 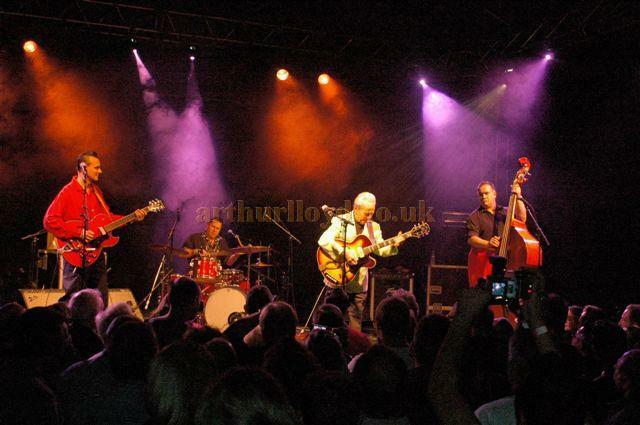 Right - Charlie Gracie in 2008 - Courtesy Charlie Gracie Junior. The "HIPP" is still widely known here in the States. We have always been proud of the fact that our father played a small part in the history of that great showplace. Charlie, Snr. 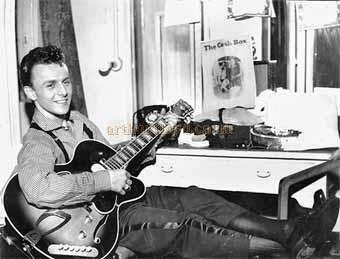 created quite a stir when the Grade agency booked him on an extensive tour in the late summer and fall of 1957. Dorothy Squires, your "Bette Davis of song," refused to take second billing to my father at the Hippodrome. 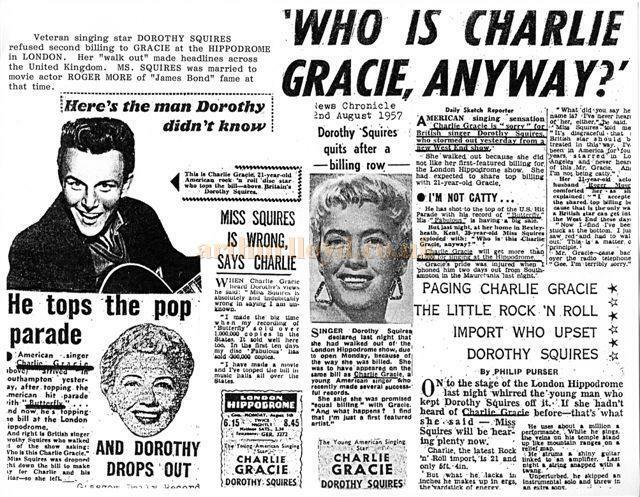 Claiming she "never heard of him" and the fact that he was an ambassador of this ''newfangled rock 'n' roll stuff" didn't improve her opinion of him. 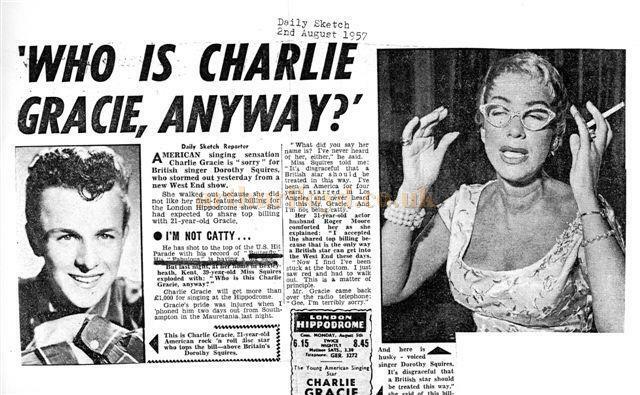 All this created a big publicity circus for my father and garnered him a wealth of press coverage. He was a smash at the Hippodrome and in the provinces. 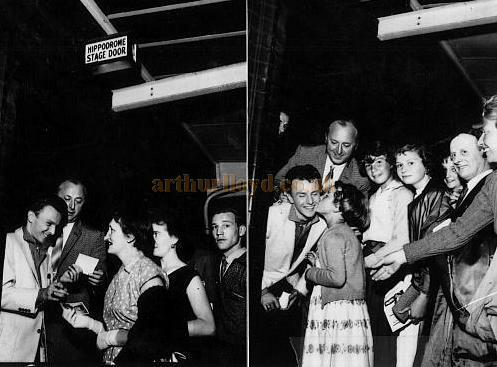 He returned for another extensive tour in the spring of 1958. Ms. Squires later apologized and they met at some other venue. This is such fun stuff to look back on and its one of the million great stories surrounding the Hippodrome, I'm sure. Right - Charlie Gracie in his dressing room at The Hippodrome posing for British photographers. My father was riding high in the late 50s with hit recordings such as:- Butterfly, Fabulous, Ninety-Nine Ways, Wanderin' Eyes And I Love You So Much It Hurts. 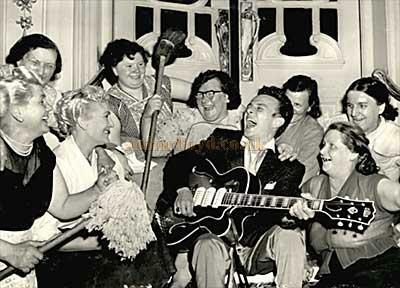 Left - Charlie Gracie, his guitar and the "char-ladies" backstage at the Hippodrome: August 1957. He is still an active performer and continues to play in the U.K. where he has a loyal following. 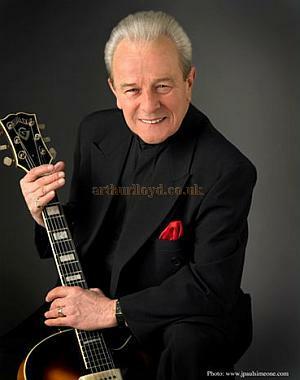 McCartney, the late G. Harrision, Van Morrision, Cliff Richard and Graham Nash have all credited my father's singing/guitar-style as an influence on their own careers. 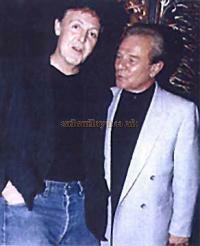 Right - Charlie Gracie with Sir Paul McCartney - 1999. Sir Paul covered FABULOUS in 1999. Nash duets with my father on his current cd. 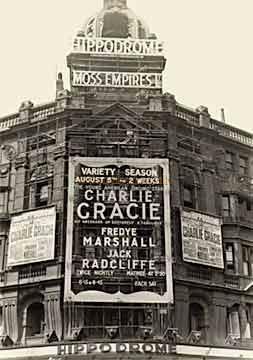 Very Sincerely, CHARLIE GRACIE, JNR. 31st May 2003. 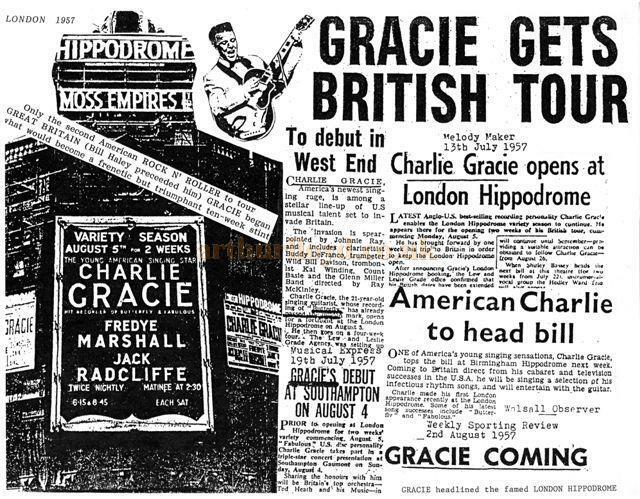 Above - Four Press cuttings about Charlie Gracie at the London Hippodrome in August 1957 - Courtesy Charlie Gracie Junior. 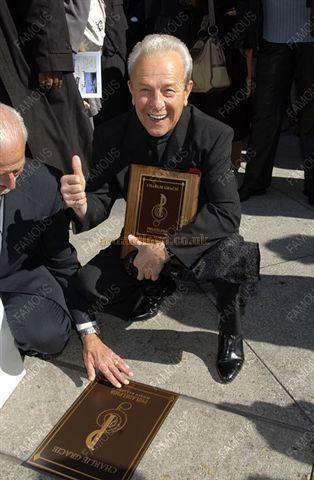 Above - Philly's first rock 'n' roll star; Charlie Gracie, along with Dee Dee Sharp, Billy Paul, Tammi Terrell and Clifford Brown were inducted onto the Philadelphia Walk of Fame, 'Avenue of the Arts,' on Oct. 23, 2008. - Photo and caption courtesy Charlie Gracie Junior. 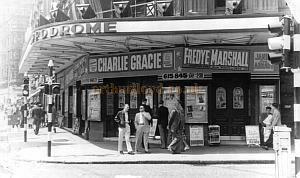 Most Images on this page are Courtesy Charlie Gracie Jnr. 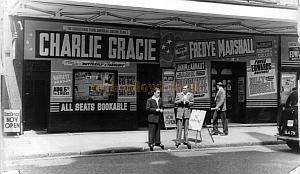 You may like to visit Charlie Gracie's own Website here. 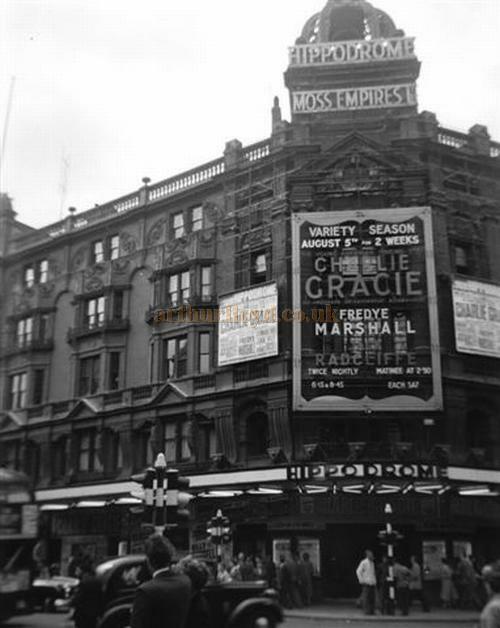 Information about the London Hippodrome Theatre can be found on the site here, and an Index to all the many Special Features on the London Hippodrome on the site can be found here.